Sugar. So sweet. So yummy. So addictive? So TOXIC??? I know. It sounds extreme. But with so many of us struggling with health and weight and heart disease and diabetes, might we be doing something wrong? Dr Robert H Lustig thinks so. He has been researching the effects of sugars on the endocrine system since 1998 warning about the dangers of fructose and its involvement in the obesity, heart disease and diabetes epidemics in adults and now children. He was recently interviewed for a segment on 60 Minutes. I personally was shocked by the sheer AMOUNT of sugar they say EACH American eats each year: Picture source here. 130 pounds of sugar per year! But, when you think about it, sugar is in EVERYTHING. Just the other day, when I was shopping for my Reboot at the local Sprouts market, I picked up a can of sweet kernel corn. I turned it over to look at the ingredients as I'm now in the habit of doing, and was appalled to see SUGAR on the list!! So I picked up a similar can next to it (both just called "Sweet Kernel Corn") and was relieved to find one without added sugar. But it would've been just as easy to have grabbed the first one, not looking at the label. Seriously, they have to make sweet kernel corn MORE SWEET?!?!? I was super happy with my non-sugar corn, and enjoyed it in my Reboot salad this week. There really are so many hidden sugars out there - it's in bread, yogurt, peanut butter, crackers, cereal, ketchup... EVERYTHING! And there's always something to celebrate, no? Easter = chocolate bunnies and baskets full of marshmallow sugary peeps. Valentines' Day = more chocolate and sugary hearts. Halloween = all sorts of sugary candy. Thanksgiving/Christmas = pies, cookies, baked goods from the neighbors. Summer = ice cream sundaes and popsicles. Birthdays = cake, cake, and more cake. Offices = candy jars, cookies, birthday cakes. Weekends = time to relax and reward yourself for the long hard week. Are you ready to kill the sugar craving in your life? What I know from experience is that a Reboot is successful in doing just that. Toss with 2 Tbsp olive oil, 1 tsp salt, and 1 tsp cumin. 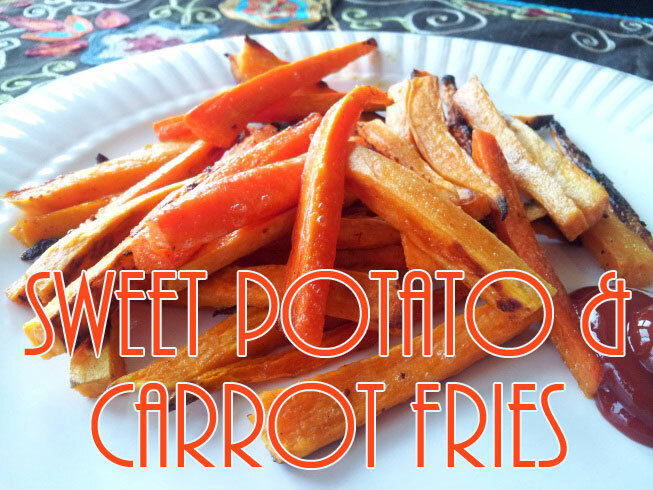 Bake for 40 minutes at 425... and voila: perfect sweet potato and carrot fries! 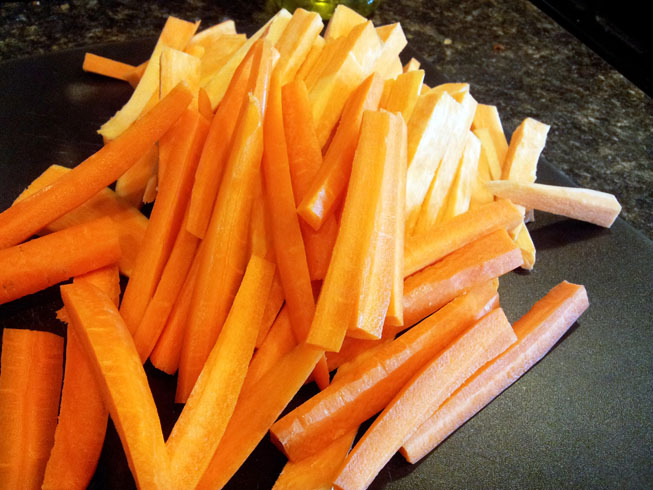 I was most surprised at how good the carrot fries were. I thought they'd surely be crunchy since they started out so much harder than the sweet potato. But, they were perfectly crispy on the outside and soft in the middle. Yum. Yum. YUMMMMMM!!! What do you think about sugar? You know how I feel about the subject. Do you think it's DOABLE in your own life to stop eating sugar altogether?